While there is plenty of theatrical silliness in Morag Fullarton’s cut down version of Casablanca, told with a multi-tasking, quick-changing cast of three, what struck me most was how much respect is given to the original. Despite the fact that I’ve never seen the film, I’ve absorbed enough of its cultural impact over the years that I’m familiar with its most iconic moments, and as writer and director, Fullarton ensures these are played almost entirely straight. In fact, it’s straight enough to make me think I’d quite happily watch a full length, full scale, ‘serious’ stage adaptation of the film. The cast have been set a Herculean task – having to bring both the characters and the film cast to life. 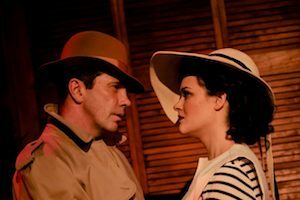 Gavin Mitchell and Clare Waugh are not just Rick Blaine and Ilsa Lund – they’re Humphrey Bogart’s Rick Blaine and Ingrid Bergman’s Ilsa Lund. Jimmy Chisholm has been landed with the most demanding set of multiple roles and carries each off with brilliance – including one moment where he seems to exit the front of the stage and almost simultaneously re-emerge as another character at the rear of the stage. And on top of all that, they also have to play ‘themselves’ and several more characters in the B Movie and short films that are an inspired ‘additional featurettes’. (A comparison of published running times suggests the ‘Fringe Version’ may not include these ‘additional featurettes’ so if you can get along to the Tron it’s probably a better option). Fullarton's direction drives the show on at considerable pace and the comic momentum built is simply irresistible - crammed full of visual, aural, physical and theatrical gags with each and every one hitting the mark. Barry McCall's sound design also adds greatly to the show - both in atmosphere and with a number of perfectly executed sound effects. 'Casablanca' is one of those very rare shows that I have no hesitation in recommending to absolutely everyone and I'm certain it will be a huge hit at the Fringe. I simply can't imagine anyone coming out of this without a huge grin plastered all over their face that will last all day long. Casablanca: The Gin Joint Cut ruins at the Tron until 23rd July and then at the Pleasance Courtyard from 3rd to 29th August as part of the Edinburgh Fringe. Image by John Johnston Photography used with permission. That sounds great. I'm not going to make it to Edinburgh this year. I hope it comes to London. Saw the show last night. I have seen the film several times. The show certainly does justice to the original and is played with respect. A great nights entertainment. It's a pity that I'm on the other side of the pond and a few months too late to see this. I think I would have really liked it. The premise of a super-minimal cast sort of reminds me of the theatre adaptation of The 39 Steps that's making its rounds here. So entertaining, so much fun to put on. Do you think that there's the possibility of the rights to this adaptation being released for other performance? Also, funny that you mention a full-scale performance. I am reminded immediately of the production I saw in Japan put on by the famous all-female Takarazuka Revue, which also paid a great amount of respect to the original (save the blackface. Good lord, blackface...). And it was a musical! Come on Glasgow - "The Pitmen Painters"